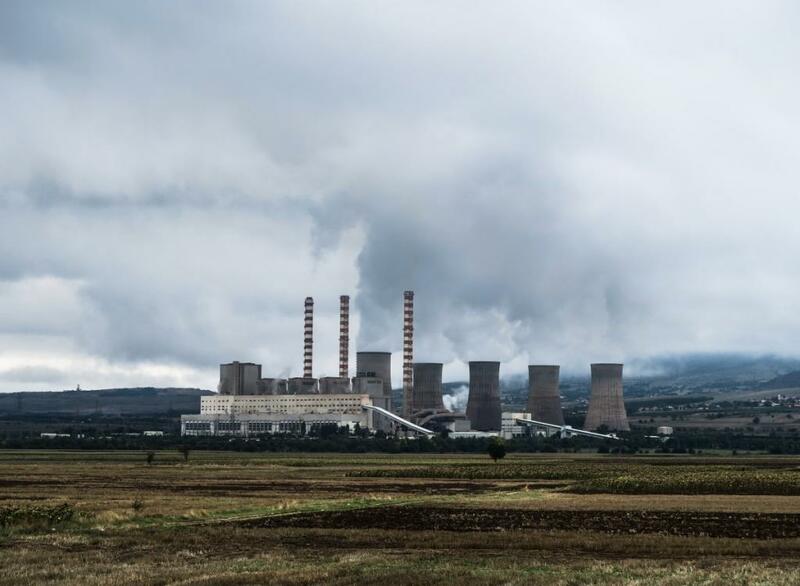 A small group of companies across the world is responsible for one-third of global annual emissions, revealed a Thomson Reuters report titled ‘Global 250 Greenhouse Gas Emitters’. Released ahead of the UN Climate Change Conference (COP23) at Bonn, the report features 250 global companies—operating mainly in oil, gas, utility, automotive, aircraft, manufacturing, steel, mining and cement sectors—that make large contribution to global greenhouse gas emission. Coal India tops the list of 100 businesses with the highest CO2 emission. However, it has seen a reduction in emissions from 2,076 million tonne (MtCO2) in 2015 to 2,014 MtCO2 in 2016. Even then, the emission of a single state-owned business is about 86 per cent of the country’s total CO2 emission. Two other state-owned Indian companies feature in the list: NTPC Ltd 185.6 MtCO2 and Oil & Natural Gas Corporation (ONGC) 149.8 MtCO2. The only privately-owned Indian company to join the league of top 100 emitters is Reliance Industries with an estimated CO2 emission of 263.3 MtCO2 NTPC Ltd.
Out of the top 15 highest GHG-emitting companies, five of them saw substantial increase in emissions in 2016 when compared with the previous year. The US-based oil and gas company, Exxon Mobil Corporation, which ranked third in 2016, has seen an increase in CO2 emission. China Shenhua Energy, the largest state-owned coal mining enterprise in Mainland China featuring among top 15 CO2 emitters, has also seen a rise in emission from 643.8 MtCO2 in 2015 to 665 MtCO2 in 2016. This is larger than the total CO2 emission of Saudi Arabia in the same year. According to the report, the top 15 companies, which are ranked based on total emissions, account for about 10 per cent of global annual emissions. “Without continual reductions in emissions from this group of companies, effectively mitigating the long-term risks of climate change is not possible,’ the report argues. On looking at the country-wise concentration of these carbon-intensive businesses, it appears that 14 out of the top 100 companies are from China with names like China Coal Energy and Yanzhou Coal Mining featuring in the list. 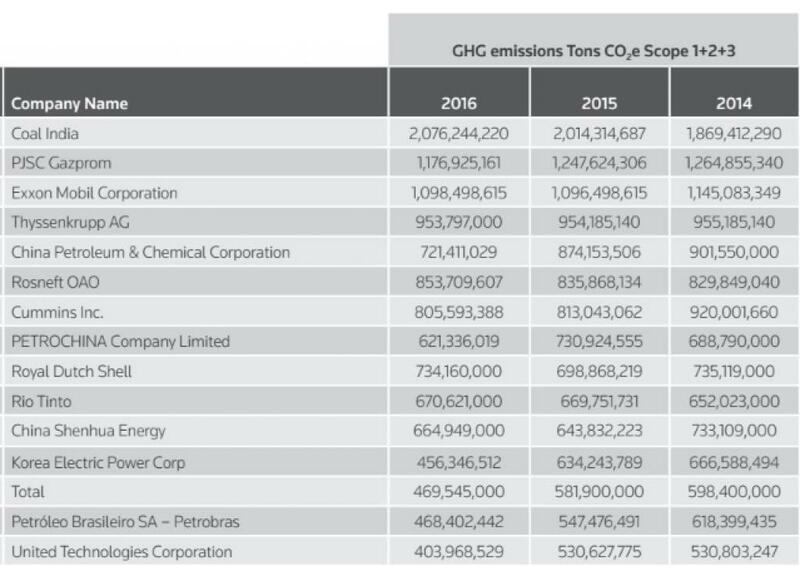 As the report reveals, 26 companies from the US, which is historically the largest emitter of greenhouse gases, feature in the list. This is the highest for an individual country. The list if mostly dominated by energy and automobile business such as General Motors, General Electric, Boeing and Ford. The Dow Chemical, which acquired Union Carbide Corporation (UCC)—a company responsible for the Bhopal Gas Tragedy—emitted 120.3 MtCO2 in 2016. It is more than Nigeria’s total carbon emission in 2016. While total global emissions remain stable, it still means that millions of tonnes of GHGs are being added to the atmosphere every year, making it more difficult to keep global warming to 2 degree Celsius as expressed in the Paris Agreement.